LUTREPATCH STUDY - research study evaluating the safety and effectiveness of a new delivery method of a medication for women who are trying to get pregnant. OSTEOPOROSIS TREATMENT TRIAL - a research study that may increase bone strength and help maintain your lifestyle. Click here for more information. ACNE STUDY - This is a mild to moderate acne study. Qualified participants are between the ages of 16-45 years and generally healthy. MENOPAUSE - HOT FLUSH STUDY - This research study explored the effects of study medication on hot flush frequency. BONE STUDY - Eating disorders and significantly low weight in young girls can cause weak bone. This clinical research study evaluated 10-17 years old and the effect of an investigational medication on bone strength in girls who are significantly underweight or have been diagnosed with an eating disorder. MENOPAUSE - VGEF study - This study investigates the effect of estrogen replacement therapy on the level of a molecule that may decrease the incidence of cardiovascular disease. POMEGRANATE STUDY - Are you a healthy postmenopausal woman? 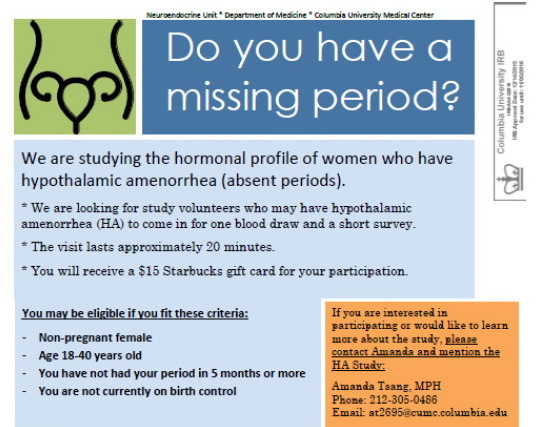 ANOREXIA NERVOSA STUDY - Are you between the ages of 18-45? Have you been diagnosed with anorexia nervosa within the last five years? BODY COMPOSITION STUDY - Are you a healthy female between the ages of 18-45? Are you interested in knowing more about your metabolic rate, body composition and bone density? BLACK COHOSH STUDY - Are you between the ages of 45-70? Are you having 5 or more hot flashes per day?